Morito Suganuma (菅沼守人) was born in Fukushima, Japan in 1942. A regional pole vaulting champion in high school, he moved on to studying Aikido with Nobuyoshi Tamura in 1963 and then entered Aikikai Hombu Dojo in 1967 as one of the last uchi-deshi to train there under Aikido Founder Morihei Ueshiba. 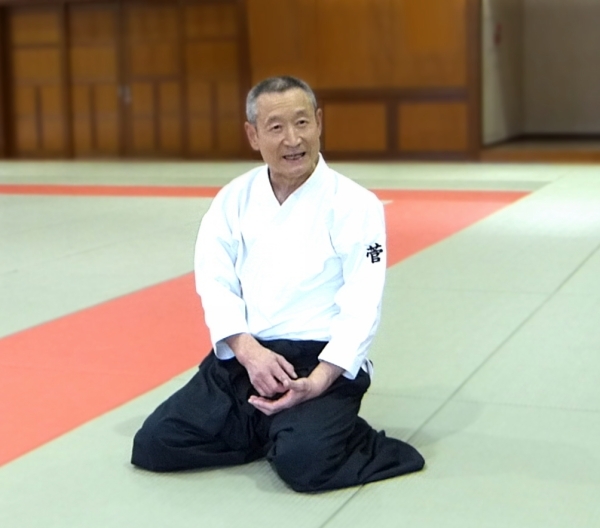 He is the head of Aikido Shoheijuku, which has a large number of Aikido dojo centered around the Fukuoka area of Kyushu, Japan, and was promoted to 8th Dan by the Aikikai in January 2001. 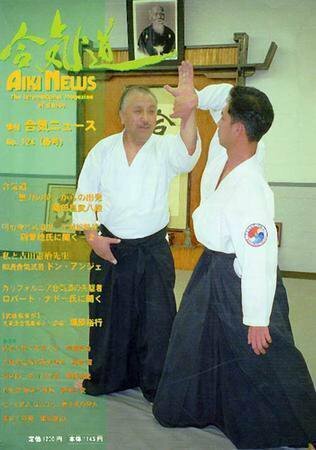 This is the first part of a two part interview with Suganuma Sensei that originally appeared in the January 2005 issue of Gekkan Hiden (月刊秘伝 / “Secret Teachings Monthly”), a well known martial arts magazine in Japan. This interview was also published in a collection of interviews with students of the Founder published in Japanese as 開祖の横顔 (“Profiles of the Founder”) in 2009. There was a short introduction to this work in the article “Morihei Ueshiba – Profiles of the Founder“. A number of English translations of interviews from that collection appeared have appeared previously – Nobuyoshi Tamura Sensei (Part 1 | Part 2), Hiroshi Isoyama Sensei (Part 1 | Part 2), Shigenobu Okumura Sensei (Part 1 | Part 2), Nobuyuki Watanabe Sensei (Part 1 | Part 2), Masatake Fujita Sensei (Part 1 | Part 2) , Yoshimitsu Yamada Sensei (Part 1 | Part 2), Kanshu Sunadomari Sensei (Part 1 | Part 2), Hiroshi Kato Sensei (Part 1 | Part 2) and Yoshio Kuroiwa Sensei (Part 1 | Part 2). The Founder’s body was extremely soft. Q: First, I would like to ask what first inspired you to learn Aikido. A: At first it was because I read an article about O-Sensei in a magazine when I was in my sixth year of elementary school. After that, I enrolled at the physical education department (*Suganuma Sensei was a pole vaulter) at Juntendo University (順天堂大学 ), but I got injured and ended up enrolling at Asia University (亜細亜大学). There I was able to see the training of the Aikido club with my own eyes, and that was how I began Aikido. That was in Showa year 38 (1963). Q: What was the instruction like at the university? A: It was Nobuyoshi Tamura Sensei. Now he is teaching in France. Q: When did you enroll at Hombu Dojo? 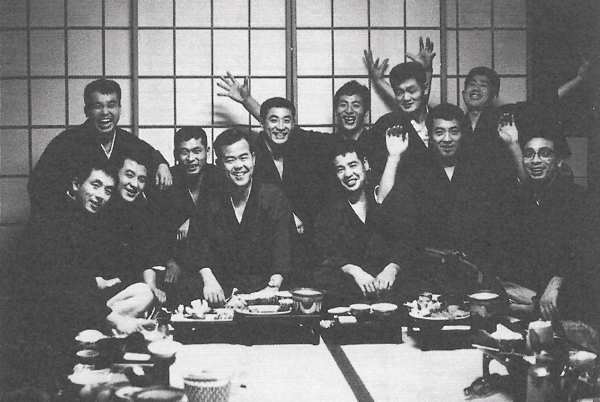 A: I enrolled as an uchi-deshi when I graduated in Showa year 42 (1967). Those who were there around the same time were Seishiro Endo Sensei (遠藤征四郎) and Masatake Fujita (藤田昌武). 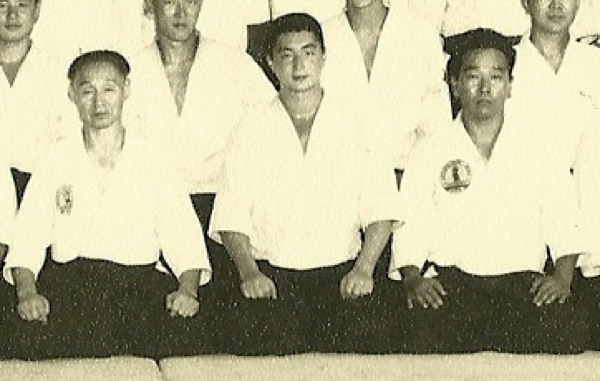 O-Sensei was 84 years old at the time, I learned from O-Sensei for the next two years, until he passed away. Q: You were living in the dojo, not commuting from outside? A: That was just at the time when they were rebuilding the dojo, so we rented rooms nearby. When they rebuilt the dojo they first began with O-Sensei’s living quarters, so O-Sensei would go back and forth between Iwama and Hombu Dojo, and would stay in the office of the old dojo. At those times we would massage O-Sensei’s fingers and shoulders until he went to sleep. So we would be with him the entire time from when he arose in the early morning until he retired in the evenings. We would wash his back in the bath. Q: What was O-Sensei’s body like at the time? A: When I saw him in the bath the muscles of his upper body were drooping down, and O-Sensei would joke “Look, wings!”. (laughing) In the past that had all been solid and firm, so I think that he must have had really thick arms and an extremely good physique. Q: Now that you mention it, there is a scroll with a drawing of O-Sensei’s body, isn’t there? A: That was drawn by a famous artist, but that wasn’t a direct sketch, it was based on the artist’s image of O-Sensei with power in his body, a kind of symbolic image. When I touched his body in the bath his muscles were extremely soft, and when we did flexibility exercises before practice O-Sensei would stretch his body with the students for about thirty minutes. He was so soft that one could hardly believe that he was an old man of more than eighty years. When we did what is now called “Funakogi Undo” (船漕ぎ運動 – “rowing exercise”), but was previously called “Ame-no-torifune” (天之鳥船 – “Heavenly Bird Boat”), his movements were extremely soft. Q: Funakogi Undo is an exercise unique to Aikido, isn’t it. What is its actual meaning? A: One rows a boat in order to move forward, keeping their eyes turned towards their goal. O-Sensei often called this goal “A world of harmony and unity” (和と統一の世界), in other words, a world without conflict. Then as now, violence and war continue, but I believe that the meaning was for “everybody to row together” with the goal of asking for assistance through Aikido training that a world would come where all of the world’s people could join hands with each other. Q: Is that also the reason that we do warm-up exercises together? A: Yes, it is. I think that this is an excellent method of creating the unified body that we seek in Aikido, in other words, a body in which the hands, waist and legs are made to operate together. Q: Did you get concrete explanations from the Founder? A: From a state in which the hands are open, close them firmly and pull them backwards. Conversely, there are exercises in which one thrusts the hands forward while closing and then opens them while pulling backwards. Also, we always practiced what was called “Furitama” (振魂 – “spirit shaking”), in which we clasped our hands in front of our abdomen and shook them. At this time the right hand was on the bottom and the left hand was on the top – in Kototama (言霊) the right represents the body and the left hand represents the mind. We were told “Place your mind on the foundation (the body)” (土台「身体」の上に霊を載せる). Q: Are Funakogi Undo and Furitama practiced together as a set? A: Yes, that’s right. O-Sensei would always do three sets, with each set consisting of three repititions of Funakogi Undo and one repitition of Furitama as a set. Q: What was the Founder’s daily life and training like at the time? 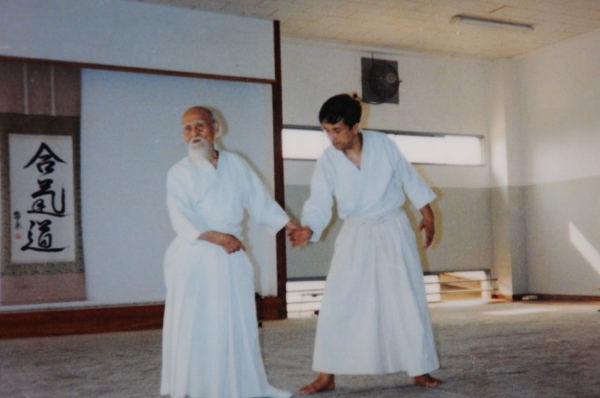 A: When the current dojo was completed there was a simple Kamidana in O-Sensei’s room, so before each practice he would would always chant the Norito (Shinto prayers). Then he would go to the dojo. O-Sensei was someone who possessed a unique presence, and just by entering the dojo everything would stop – one sensed some kind of aura emitting from his entire body. The training was extremely severe, but there was kindness in that severity. For example, he was extremely skilled at letting you know where you ought to be, he was very careful about that kind of thing. Q: What were your impressions of actually taking ukemi for the Founder? A: O-Sensei’s techniques were completely effortless. Even when one was thrown the ukemi had a good feeling. It felt as if one were being absorbed. Even when it is the same technique, when one receives it from someone who has not mastered it there are odd times when there is pain and one has to endure certain things, but there was none of that. His movements were truly effortless. I was fortunate to have been able to receive O-Sensei’s techniques. A: Yes, they were fast. There are probably not very many people who can move that quickly at that age. During tai-sabaki his entire body would move in an instant – it was the same when he was using a staff or a sword. Q: Did he use many weapons? 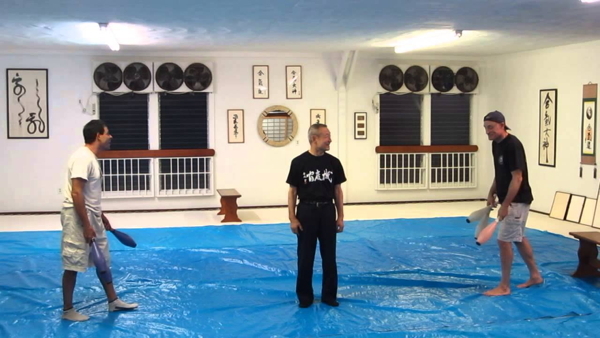 A: During practice, in addition to staff and sword, he would also use a folding fan. This may have also been used in place of a tessen (鉄扇 – “iron ribbed fan”), but O-Sensei always carried a folding fan and would often use it to instantly control opponents coming to strike with a sword. Q: I have certainly seen many photos of demonstration in which a folding fan was used to control a sword. A: That’s right, those are movements that can also be used with a tessen or with a short sword. Also, he often demonstrated atemi with the folding fan. At the same time as he controlled his opponent’s attack in an instant, he would thrust with the folding fan, saying “Look – you enter here!”. 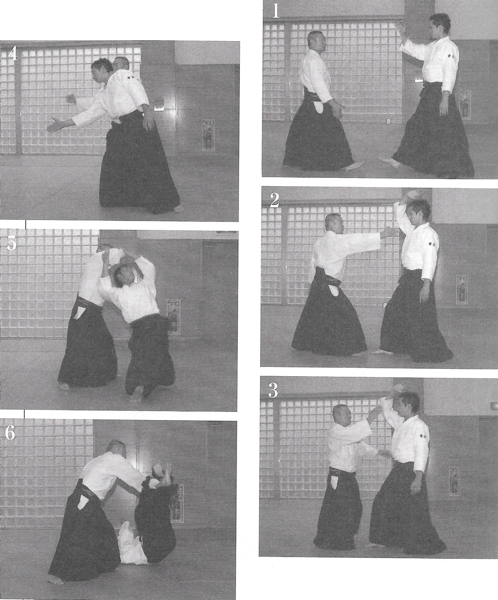 For example, within the flowing movement of Irimi-nage there are a number of places where atemi can be inserted, but it’s so fast that they are difficult to understand, so he would explain them with the folding fan. Q: I see. In your case, since you came in with the viewpoint of a competitor in the pole vault, didn’t you feel that there was some “vagueness” in Aikido? A: I did feel that way sometimes. (laughing) However, during training in Kokyu-ho when O-Sensei grabbed both my wrists I was instantly unable to move. 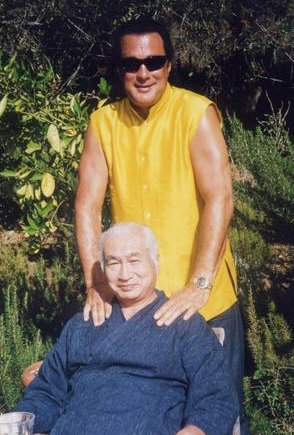 At the time O-Sensei was 158 centimers tall (5’2″) and he weighed less than sixty kilos (132 lbs), but just by holding me lightly I was completely unable to move. While actually touching hands with that O-Sensei and my sempai I began to feel “there’s a magnitude of difference”. For that reason I thought “I want to be like that someday” and that yearning grew stronger. Q: There was some power other than just weight, wasn’t there? A: It wasn’t a matter of my wrist hurting, or something like that. It felt as if he used his entire body so efficiently that my center was controlled. Things like Nikyo are certainly techniques that are effective against the wrists, but I think that is a technique that takes one part of your opponent and controls their entire body. So, by just applying a small amount of pain they become unable to move. A: It wasn’t just being soft. It felt as if in each instant he would be able to move his body freely, and while there were times in which one felt as if they were being absorbed while being thrown, there were also times when one was held down firmly in place. A: There are also some where he appears to run around in a rampage. (laughing) But I believe that O-Sensei’s techniques did not depart from the principles of nature. He moved as his mind directed and that became technique. Q: I think that it must also be different depending upon the era during which one learned the Aikido transmitted by the Founder. A: I think that is also an issue, but in the end I think that what is important is how each of the Shihan following him took in what they were given. 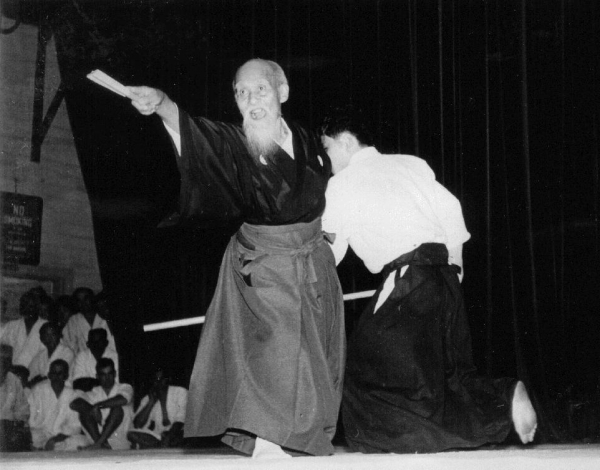 Even Shihan who trained during the same era have different kinds of movement, and I don’t think that one can say which is correct and which is mistaken. If you have ten people none of them will be the same, I think it is the same as that. You may be correct, this photo was undated but must have been after 1967. In any case, the names appear here as they appeared in the original article in Japanese.